Anybody have a date for the 400 miler this year, the AVC site still has last years date ,is it still the weekend before memorial day ? 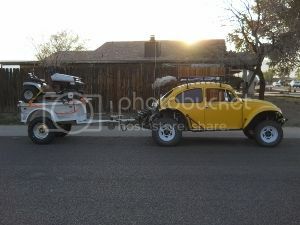 The buggy is in the process of getting front brakes and some gussets on the cage i,m fabbing a spare tire rack and its an emission test away from being street legal I hope some of the other AZ baja guys are thinking about this run . yea! it lives just got my engine up and running! sorry for taking so long to get back with you. The correct date is the 19th & 20th of May. I can't waite to get it back on the road just a few little things and I'll be out cruising the trails. It’s that time of year again…. The awesome 400 Miler is coming up fast May 19-20 this is almost 400 miles of dirt starting out at the 4 Peaks Road leaving at 8am sharp take the 4 Peaks Road about a mile back and look for all the buggies. I will be having breakfast at Denny’s in Fountain Hills. I will be leaving Denny’s at 7:30 a.m. sharp. The last gas will be in Fountain Hills, the next stop for gas will be Pumpkin Center, then Young, Strawberry and Camp Verde, then home. I really don’t need to say much about this run other than the road isn’t that bad, it’s the speed and the distance that seems to cause cars to break. Loose nuts and bolts and flat tires seem to be the most common repairs. hope to see a few bajas out there three made it last year was realy neat! I put it on the event calendar. It’s that time of year again…. The awesome 400 Miler is coming up fast May 19-20 this is almost 400 miles of dirt starting out at the 4 Peaks Road leaving at 8am sharp take the 4 Peaks Road about a mile back and look for all the buggies. I will be having breakfast at Denny’s in Fountain Hills. I will be leaving Denny’s at 7:30 a.m. sharp. The last gas will be in Fountain Hills, the next stop for gas will be Pumpkin Center , then Young, Strawberry and Camp Verde , then home. I really don’t need to say much about this run other than the road isn’t that bad, it’s the speed and the distance that seems to cause cars to break. Loose nuts and bolts and flat tires seem to be the most common repairs. I getting a hotel room this year in Pine. If you dont want to tent it this year come and stay..
Great trip! 15 cars showed up for this awesome event. We started out at 8 a.m. to race the hill, stopping for photos and cold sodas. The road was clean and clear and there was very little traffic to worry about. This was the first long trip with the new car so I was driving kinda slow and careful so I would not scare Matt, Alex, or Maddy. I found it was hard to drive with my head and not my foot (who would have thought??) I was for the most part able to keep up … kinda!!@?? – Maybe? We stopped in Punkin Center for fuel and then up to the 609 road for lunch. I think lunch tastes better with a little bit of dirt on it. From there the group stopped at the cave for a soda break and off to Young for ice cream and gas (exploring a new bar across the street—Way Cool!) and off to Haggler Creek (very very nice). Team Baja spent the night there with the shade trees and the water of Haggler Creek nearby… I am way jealous . Most of the drivers headed up the Control Road to find camp. I stayed in town. The next morning we had breakfast in Strawberry and drove down the Control Road to 260 where we met up with Team Baja. They were all smiles and looking forward to taking a swim sometime that day. Back to Young we raced and some of us went down the Cherry Creek Road to 260 then took the A+ Road to Four Peaks and then home. I was not willing to give up the dirt yet, so I took 88 to Apache Junction then home. We did not see any fires or any bad smoke anywhere but the fire fighters and the forest service were out in force, enforcing the NO FIRES ban. Something new folks… I was told that you can no longer have propane fire pits and if you are using propane for cooking it can not be on the ground or placed on a natral wood surface -- you might want to check this out before you get a fine. My hat comes off to Team Baja, Brian and Merlyn with stock Baja’s have come on many of the AVC’s runs without killing themselves or their cars and this shows that most of our runs are not hard and anyone using their head can have fun without breaking their car or killing themselves. Just slow down take your time and enjoy the ride. Maybe it’s more about the riders than the ride. Thanks for making this another great AVC event. Just a reminder, we are going to Fort Tuthill Campground for Memorial Day weekend (May 25 – 29). I like to get up there the day before the weekend and leave the day after the weekend so I may avoid some of the traffic. On July 4, we’re going back to Fort Tuthill Campground July 4 – July 8. Try to reserve your campsite as soon as possible and remember you might need to bring a jacket. The Flagstaff off-roading is very light with not any real big challenges, but a street legal vehicle is required to get to the dirt. All vehicles are welcome on this outing. Well the votes are in -- it looks like we are going to Fort Tuthill Campground for Memorial Day weekend and for the 4th of July weekend in the cool pines of Flagstaff. Satellite tv is spotty in this campground due to all the trees. We have found only a few campsites in Flagstaff that have shade and good satellite reception. I went online and reserved my campsite, I am in spot A-5 on both Memorial Day and the 4th of July. If you have a super coach you may want to recon this campsite. If you have anything 25ft or smaller I don't think you will have a problem anywhere else. I have a 41ft class A and I have stayed in A-7 in the past with no issues parking. I have also stayed in F-11 and G-7 but it kinda tough to get into but with a portable dish you can get Satellite. I am sure that the campsites are filling up fast. I would go online and reserve your site as soon as possible, this is not a very big campground but seems to be very popular. They have just recently lost the use of their overflow camping area. They have a brand new reservation system that is not working properly, if you are unable to get a printout of your reservation you will need to call and they will put you in manually. Dawn and I are familiar with this area and off-roading is easy and beautiful, but you do need to be street legal. Oct 6th - 7th AVC Crown King campout.